Arrive Srinagar by morning flight. 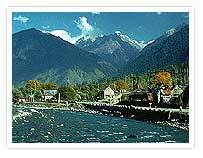 Srinagar the summer capital of Jammu & Kashmir state on the banks of river Jehlum. 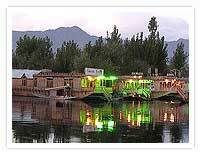 Lakes and gardens are the charm of Srinagar city with the back drop of Hariparbat , Shankaracharya hill & Zabarvan ranges. On arrival transfer to hotel. Later in the after noon enjoy a Shikara ride (A boat well decorated to the mood) on Dallake visiting. Full day excursion to Gulmarg the Meadow of Flowers. One of the most silent vallies in Kashmir. Very popular for its snow fall in the winter and a popular skiing destination. It is a smooth drive till Tangmarg 15 km short of Gulmarg when the Zig Zag route starts through the forest of pine tress. One of the most spectacular and pollution free drives. Gulmarg has one of the finest high altitude Golf courses of the world. Gulmarg is incomplete without a horse ride ane newly introduced Gandola lift which takes you 5 km to Kong Dori & Affarvat hills. After a days excursion around Gulmarg drive back to Srinagar. After breakfast visit Pahalgam. One of the most panoramic meadows of Kashmir blessed with the enchanting Lidder River crossing through the meadow. 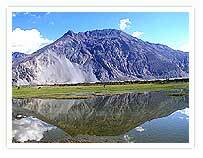 It is a 3 hours spectacular drive from Srinagar to Pahalgam crossing though the Saffron fields at Pampore. Pampore is the only place blessed with the cultivation of Saffron in whole India. Also famous for the romantic episode of most popular king Baadshah & Habakhatoon a local farmers daughter. Further, ahead are Avantipura ruins the former capital of Kashmir under king Avantipuram. It is a beautiful drive through villages & farm land and will pass along the river Jehlum at certain points till you reach Martand natural springs. The crystal clear water of these springs has medicinal properties and home to only Sun temple on the top of hill in the valley. Today after breakfast start your trip to Kargil enroute Drass village the worlds IInd coldest place and ascent gradually to the Zojila pass till you reach Kargil the gateway to Zanaskar Himalayan ranges. 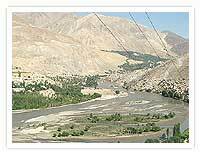 Kargil was once at the cross roads of a network of trade routes that led to kashmir, Baltistan, Afghanistan, Central Asia and Tibet and an air of romance still lingers around its narrow cobbled streets and bazaars spilling over with locally crafted curios. The town retains its conservative Balti Shia Muslim culture and has two fine mosques built in the Turkish style On arrival check in at hotel. Your cars accompanying from Kashmir will drop you here and drivers from Ladakh will meet you at this hotel for further tour. 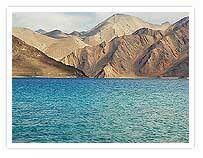 A full day trip to Pangong lake. The high altitude largest salt lake nearly 175 km long with only 25% in India and rest in China. You have to cross the Worlds third highest pass. Later drive back to Leh. Stay overnight. Today transfer to airport for your flight to Delhi. On arrival at Delhi transfer to Hotel. In the evening free for independent activities. Today visit the important monuments in Delhi and a free time for shopping . Later transfer to Int. airport for your onward journey.